Chicago Yacht Club Foundation President meets with coaches of the Indiana Sailing Association at the 2013 Safety at Sea Seminar in Chicago. 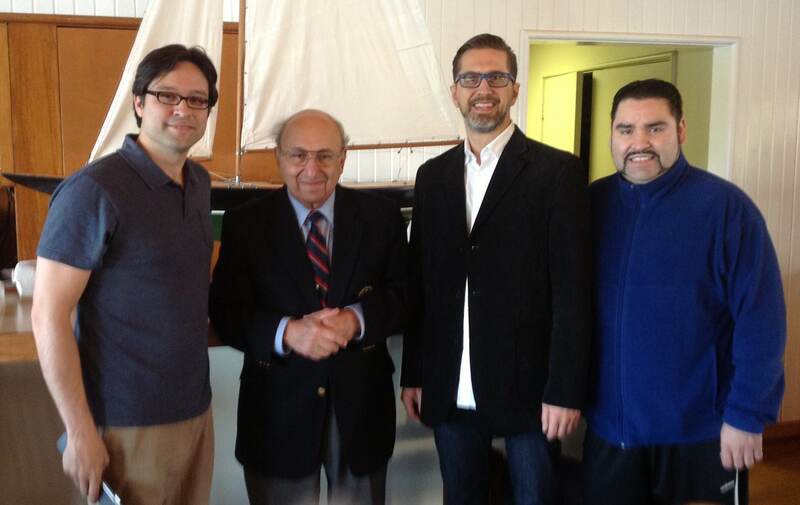 (From left to right) Christopher Kosovich of the Indiana Sailing Association, Walter G. Vartan – President of the Chicago Yacht Club Foundation, Michael Brizic and Oscar Munoz of the Indiana Sailing Association (Not pictured is Matt Tirpak of the Indiana Sailing Association). Four volunteer coaches from the Indiana Sailing Association participated in the US Sailing certified “Safety at Sea Seminar” April 20, 2013 at the Chicago Yacht Club Belmont Station on Lake Michigan with the help of the Chicago Yacht Club Foundation. Taught by immensely experienced, lifelong sailors who included some of the top names in sailing and safety on Lake Michigan, the day long seminar followed a core curriculum of required topics that included personal safety equipment, crew overboard prevention and recovery, search and rescue procedures, and emergency communications. Additional topics included hypothermia and medical issues at sea, fire precaution and extinguishing, weather forecasting, storm tactics, and vessel/crew preparation. The Chicago Yacht Club Foundation provided a majority of the funding for the Indiana Sailing Association volunteer coaches to participate in the special safety seminar this year. Walter G. Vartan, President of the Chicago Yacht Club Foundation and Past Commodore of the Chicago Yacht Club, greeted members of the Indiana Sailing Association at the start of the event. The safety training helped mark the informal launch of the the 2013 season for the Indiana Sailing Association. Michael Brizic, a volunteer coach with the association who attended the seminar, plans on carrying the knowledge he gained into the season ahead. Geoffrey Barrow, executive director of the Indiana Sailing Association, supported the efforts to obtain the grant from the Chicago Yacht Club Foundation to help extend the expertise of the volunteer coaches who participated. Participants of this special seminar will receive a US Sailing Certificate of Attendance, valid for five years. The seminar also meets the training requirements of most sailing races conducted in the United States. The Safety at Sea Seminar in Chicago was sanctioned by US Sailing and sponsored by the Chicago Yacht Club, Cruising World, Sailing World, West Marine and Landfall Navigation. The Chicago Yacht Club Foundation is a 501(c)(3) tax exempt organization that promotes an awareness and appreciation of the nautical arts and traditions to the Chicagoland community through education and activities as well as through the support of like minded charitable organizations. More information about the Chicago Yacht Club Foundation is available at their official website.